You’ve cleaned your house from top to bottom and you are ready for your first house showing – until you look down to Fido wagging happily at your feet. Your eyes trail off to the fur balls in the corner and the wet spot on the sofa where he licked up crumbs from last night’s snack. 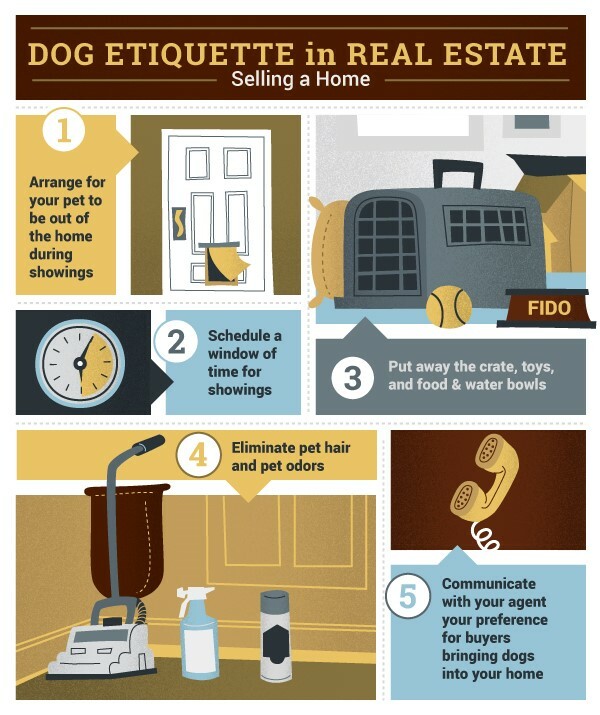 When it comes to showing your home, it is best if Fido isn’t around. If you can’t take him for the day, a dog walker can make sure he is out of house during showings, and doggy day care can keep him for the day if there will be several showings. Once you are settled in, you can check out all the dog-friendly fun Richmond has to offer. For a bite to eat and a cold brew, visit Legend Brewing where your pooch will meet a friend or two. Now it’s time to work off any excess energy and take a walk on one of the trails at James River Park. If you have a dog who loves playing with others, visit Ruff House Dog Park for a fun time. If you’re looking for another doggy companion to join your family, visit AARF or the Campbell County Animal Shelter. With the tips in this infographic, you’ll be unpacking boxes at your new home in Richmond in no time. Once the move is done, there is plenty of dog-friendly fun just waiting to be had! Thanks to Medina James at DogEtiquette.info for this article!